This happened long ago. In those days the people were hungry. No buffalo could be found, no antelope were seen on the prairie. Grass grew in the trails where the elk and the deer used to travel. There was not even a rabbit in the brush. Then the people prayed, "Oh, Napi, help us now or we must die. The buffalo and the deer are gone. It is useless to kindle the morning fires; our arrows are useless to us; our knives remain in their sheaths." Then Napi set out to find where the game was, and with him went a young man, the son of a chief. For many days they travelled over the prairies. They could see no game; roots and berries were their only food. One day they climbed to the crest of a high ridge, and as they looked off over the country they saw far away by a stream a lonely lodge. "Who can it be?" asked the young man. scivho camps there alone, far from friends?" "That," said Napi, "is he who has hidden all the animals from the people. He has a wife and a little son." Then they went down near to the lodge and Napi told the young man what to do. Napi changed himself into a little dog, and he said, "This is I." The young man changed himself into a root digger and he said, "This is I." Pretty soon the little boy, who was playing about near the lodge, found the dog and carried it to his father, saying, "See what a pretty little dog I have found." The father said, "That is not a dog; throw it away!" The little boy cried, but his father made him take the dog out of the lodge. Then the boy found the root digger, and again picking up the dog, he carried both into the lodge, saying, "Look, mother; see what a pretty root digger I have found." "Throw them away," said his father; "throw them both away. That is not a root digger; that is not a dog." "I want that root digger," said the woman. "Let our son have the little dog." "Let it be so, then," replied the husband; "but remember that if trouble comes, it is you who have brought it on yourself and on our son. Soon after this the woman and her son went off to pick berries, and when they were out of sight the man went out and killed a buffalo cow and brought the meat into the lodge and covered it up. He took the bones and the skin and threw them in the water. When his wife came back he gave her some of the meat to roast, and while they were eating, the little boy fed the dog three times, and when he offered it more the father took the meat away. In the night, when all were sleeping, Napi and the young man arose in their right shapes and ate some of the meat. "You were right," said the young man. "This is surely the person who has hidden the buffalo." "Wait," said Napi; and when they had finished eating they changed themselves again into the root digger and the dog. Next morning the wife and the little boy went out to dig roots, and the woman took the root digger with her, while the dog followed the little boy. As they travelled along looking for roots, they passed near a cave, and at its mouth stood a buffalo cow. The dog ran into the cave, and the root digger, slipping from the woman's hand, followed, gliding along over the ground like a snake. In this cave were found all the buffalo and the other game. They began to drive them out, and soon the prairie was covered with buffalo, antelope, and deer. Never before were so many seen. Soon the man came running up, and he said to his wife, "Who is driving out my animals?" The woman replied, "The dog and the root digger are in there now." "Did I not tell you," said her husband, "that those were not what they looked like. See now the trouble that you have brought upon us!" He put an arrow on his string and waited for them to come out, but they were cunning, and when the last animal, a big bull, was starting out the stick grasped him by the long hair under the neck and coiled up in it, and the dog held on by the hair underneath until they were far out on the prairie, when they changed into their true shapes and drove the buffalo toward the camp. When the people saw the buffalo coming they led a big band of them to the piskun, but just as the leaders were about to jump over the cliff a raven came and flapped its wings in front of them and croaked, and they turned off and ran down another way. Every time a herd of buffalo was brought near to the piskun this raven frightened them away. Then Napi knew that the raven was the person who had kept the buffalo hidden. Napi went down to the river and changed himself into a beaver and lay stretched out on a sandbar, as if dead. The raven was very hungry and flew down and began to pick at the beaver. 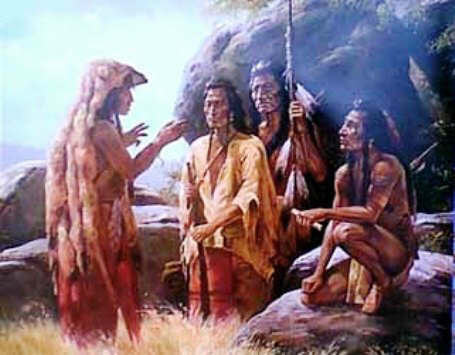 Then Napi caught it by the legs and ran with it to the camp, and all the chiefs were called together to decide what should be done with the bird. Some said, "Let us kill it," but Napi said, "No, I will punish it," and he tied it up over the lodge, right in the smoke hole. As the days went by the raven grew thin and weak and its eyes were blinded by the thick smoke, and it cried continually to Napi asking him to pity it. One day Napi untied the bird and told it to take its right shape, and then said, "Why have you tried to fool Napi? Look at me. I cannot die. Look at me. Of all peoples and tribes I am the chief. I cannot die. I made the mountains; they are standing yet. I made the prairies and the rocks; you see them yet. "Go home now to your wife and your child, and when you are hungry hunt like any one else. If you do not, you shall die."